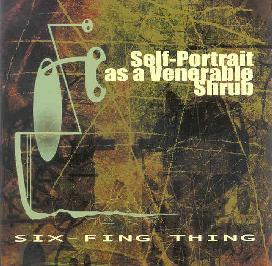 Six-Fing Thing - "Self-Portrait As A Venerable Shrub"
Led by James Cobb of Pseudo Buddha, this Texas ensemble strays far away from its parent group’s psychedelic, Middle Eastern flavored jams. Six-Fing Thing combines avant-jazz, RIO, and even dashes of classical influences played on a bewildering array of different instruments including alto, soprano, baritone, and bamboo (!) saxes, along with maui xaphoon (? ), chalumeau (another ? ), clarinet, cello, flutes, buzz sticks, guitar, keyboards, hand drums,... well, you get the idea, because the list could go on and on. After the opening track, The Basic Nobility of a Small Boy, which reminded me a little of Ultramarine from their United Kingdoms album, Cobb and company delve into some moody progressive rock and jazz territory on the nearly 17-minute medley of Logorrhea/Passing Back and Forth the Same Old Fish/The Bleeding Heart of the Blue Bottle, with lots of RIO influences on this one. Banana Tree Roots With Ants is a very minimalist piece of fairly restrained jazz, but surprises with some unexpected outbursts from the organ. Theme For a Collapsed Blue Civilization is indeed a kind of bluesy, experimental soundscape. Very easy to lose oneself in. The title track picks up the pace a little for some weird, jazzy meditations amongst clattering noises and more ambient sounds. The relatively brief Slaves of Time comes out of nowhere, offering up some crazy piano noodling with percussion that’s just all over the place. The 11 ½ minute Wisdom is a stately jazz dance number with surrealistic touches, transporting the listener to some long forgotten ballroom on the edges of the night to dance with sad ghosts. The appropriately melancholy Deep Pain of the Dung Beetle is almost classical in nature, with its sad piano drifting amidst experimental atmospherics. And then, why not, throw in some banjo for the last track, the whimsical Wisdom Returns, which also has some really strange vocals, and poignant saxophone playing. I know I’ve made Self Portrait as a Venerable Shrub out to sound like an album of really strange music in the tradition of bands like Henry Cow and Art Zoyd, and it is, but it’s also got a surprising accessibility to it. It’s both a challenging and an easy listen at the same time. Not exactly a simple thing to accomplish, but Six-Fing Thing accomplishes it in fine form. For more info visit: http://www.6fingers.com. Visit the Dogfinger Recordings web site at: http://www.dogfingers.com. Contact via snail mail c/o Dogfingers Recordings; PO Box 2433; San Antonio, TX 78298.